I have one piece of advice to give you and that is, if you ever go to Rome you have to see the Vatican Museum! Don’t wait over 20 years to see it like I did. As luck would have it, we got in free because the last Sunday of every month is free entry. We arrived an hour before opening and the line up was already two streets long, and I mean long! Even with the never-ending sea of people the line moved quickly and we were in the museum within 20 minutes. Suggestion: wear comfortable shoes, the museum is huge. I always imagined the Sistine Chapel to be quite small, well it is anything but small, it took Michelangelo 4 years to complete the Sistine Chapel and now I know why. Absolutely breathtaking. Now you are going to wonder how the heck am I going to go from Michelangelo to my One Pot Italian Eggplant Noodle Parmesan? What do they have in common? Well they are both Italian. 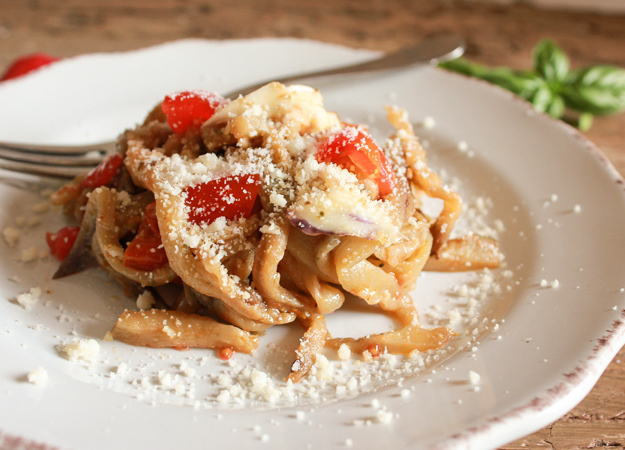 And this Eggplant Noodle Parmesan is really good, maybe not breathtakingly gorgeous to look at, but really yummy. To tell the truth this isn’t the first veggie noodle dish I have made. When I did my little road trip to the States with my eldest daughter last summer I bought one of those compact veggie hand noodle gadgets. Unfortunately eggplant does not work well. I sure wasn’t going to let that stop me. I used the longer, slimmer eggplants (fewer seeds) and I cut the noodles myself. During the warmer weather I love to use fresh tomatoes in a lot of my dishes along with some fresh basil. Basil is a breeze to grow, all it really needs is some sun and water (don’t forget to pinch off the flowers that start to grow) and there is nothing better than that beautiful scent. I decided I would lighten up the classic Eggplant Parmesan recipe a bit, of course without leaving out the fresh mozzarella and Parmesan cheese. 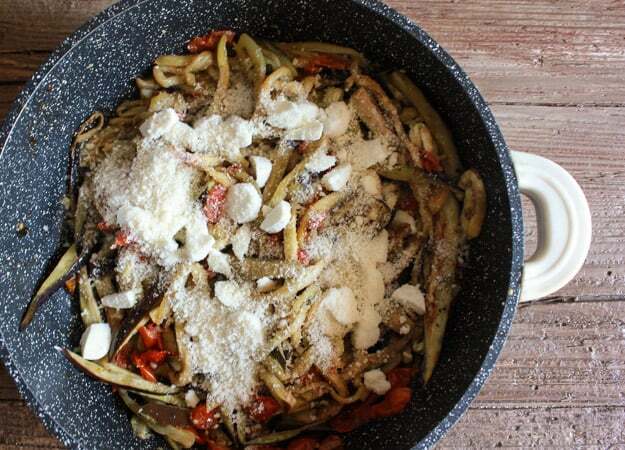 Another good thing about this One Pot Italian Eggplant Noodle Parmesan recipe is that you only need one pot, the perfect main dish or side dish. Buon Appetito! 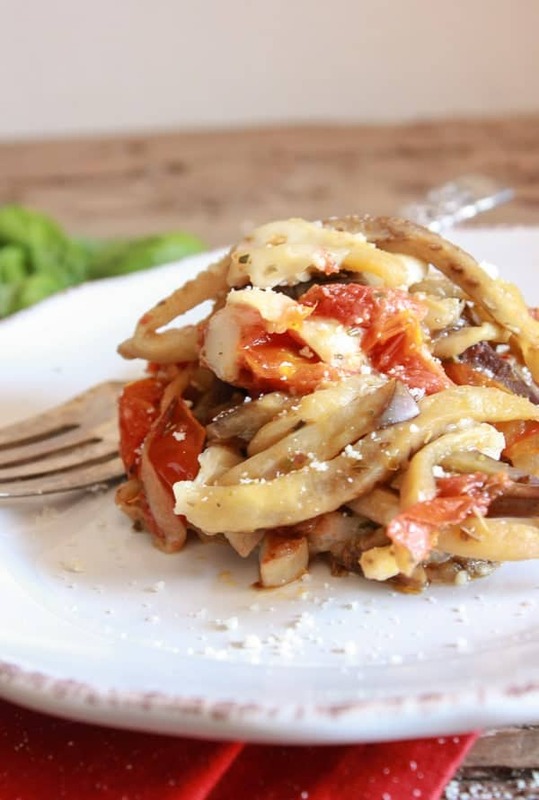 One Pot Italian Eggplant Noodle Parmesan, an easy one pot vegetarian recipe, the classic Italian recipe gets a healthy makeover. 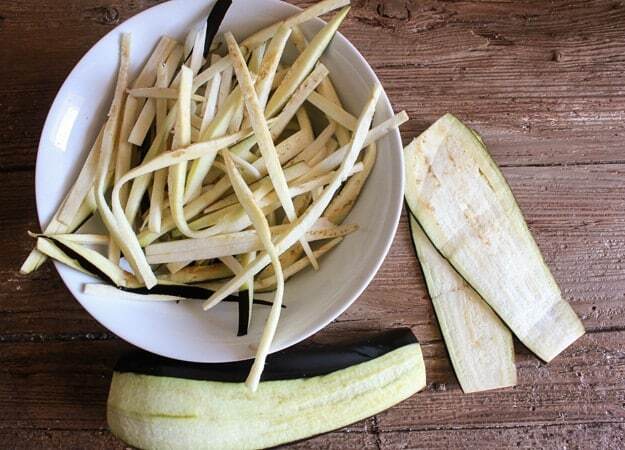 In a large bowl add eggplant noodles and 1 teaspoon salt and toss, let sit 20-30 minutes, then rinse and drain well. Prepare sauce while eggplants are sitting. 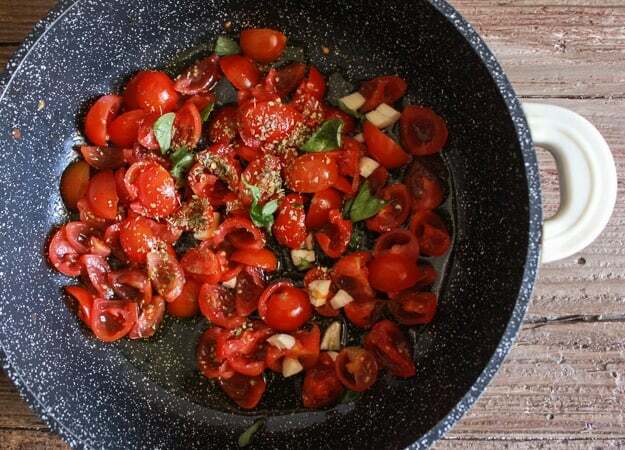 In a large pan add 1/4 cup oil, garlic, cherry tomatoes, oregano, basil, pinch of salt and hot pepper flakes, cook on medium heat for approximately 10 minutes (until liquid has evaporated and tomatoes are soft). 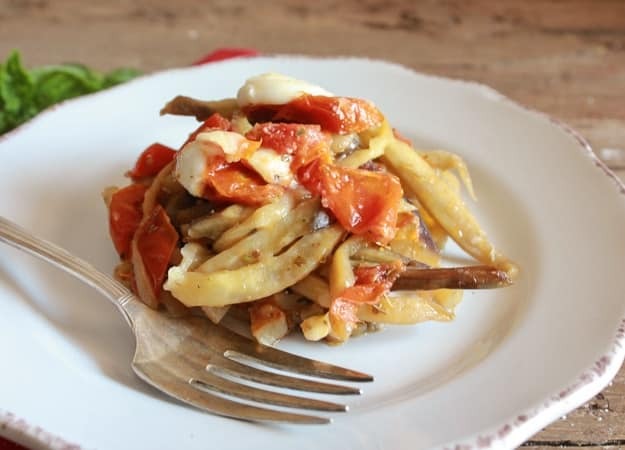 Add well-drained eggplant noodles, 2 tablespoons of oil, toss together, cover and cook for 5 minutes, remove lid and cook approximately 5 minutes or until noodles are soft (not mushy) add mozzarella and Parmesan cheese, toss gently. Serve immediately. 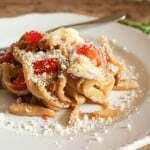 Top with extra Parmesan cheese if desired. Enjoy! Very creative. I added balsamic vinegar and portobello mushrooms. So fun! Thanks! Creative recipe. I used a skewer to spiral the eggplant. Added balsamic vinegar. So much fun! Thanks! I am glad you finally made it to the Vatican Museum. It is breathtaking and your advice for comfortable shoes is a must. Your one pot dish looks great and I’m sure the taste is wonderful. I think having something quick for dinner is a must on those days when you don’t have a lot of time. And the plus on this one would be not having empteen million pots and pans to clean 🙂 Thank you for sharing.